ST. JOHN'S, Antigua, Jul 25 2012 (IPS) - In a case of “if you can’t beat them, eat them,” Caribbean countries have embarked on a new strategy to deal with the invasive lionfish, whose voracious appetite is wiping out fish stocks from Bermuda to Barbados in what scientists believe to be the worst marine invasion in history. Regional authorities are promoting a rather unusual solution – incorporate this “beautiful menace” into their diet. Matt Strong, who heads the Bermuda-based environmental charity, Groundswell believes that a solution to the problem would be to incorporate lionfish into local menus and have it targeted by commercial and recreational fishermen. “We can essentially eat them to reduce their numbers. It’s worked before — we ate the Nassau grouper in such large numbers that they no longer exist in Bermuda’s waters,” Strong said. “Every time you are at a restaurant, grocery store or buying fish from your roadside fisherman, ask for lionfish. If we build up enough demand, the fishermen will target them,” he urged islanders. The environment official noted that every day, authorities are getting more and more reports of lionfish on the country’s reefs. “They are in great numbers on our deeper reef and now they are showing up inshore in the fish nursery grounds and relentlessly eating our juvenile fish,” Strong said. The lionfish explosion occurred in Bahamian waters in 2010 and was described then as “a plague of biblical proportions stalking the Bahamian economy”. Today, 97 percent of the reef fish endemic to the Bahamas have been eaten. In 2011, the country created an annual bash to raise awareness about the lionfish. The family event, which was held Jul. 13-15 this year, saw a total of 345 lionfish being caught. 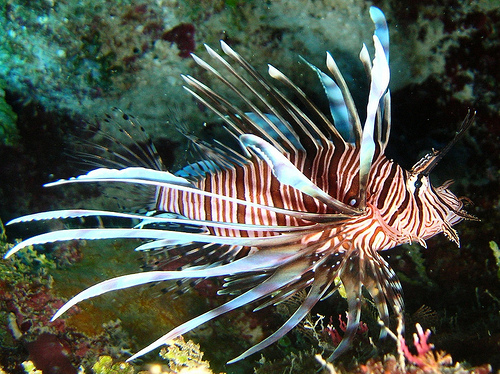 A similar event held in Dominica in July each year – the annual Dive Festival – organised by the Dominica Watersports Association, was used to appeal to citizens to assist in controlling the lionfish. The association’s president Simon Walsh said the festival this year “reflected that although this is a species that needs to be controlled in order to protect the dive sector and coastal fisheries, it is looked at as a sustainable food source”. British Marine Biologist Arun Madisetti is on a mission to encourage the people of the Caribbean to put the lionfish to their diet. “These things have no natural predator in our region,” he told IPS. Madisetti, who now resides in Dominica (which saw its first lionfish in December 2010), was on a visit to Antigua at the invitation of the local Environmental Awareness Group to give a lecture on the lionfish. Already, at least one player in the dive industry in Antigua has begun promoting the idea of eating the troublesome lionfish in a bid to control its fast growing population. “We should encourage the community to eat them because they taste really good,” said Shawn Clarke, who runs a recreation dive business here. Clarke and others who make their living from marine resources say the lionfish population has drastically increased since being first spotted here early last year. In recent times there has been concern about the fish’s venomous nature and Clarke believe this is what has kept it from most dinner plates. But he said “they are free of fish poisoning when prepared. Once you have people hunting and wanting to eat them we don’t have to worry about it so much because we want to get rid of them. The lionfish, which is native to the Pacific Ocean, is believed to have entered Atlantic and Caribbean waters during Hurricane Andrew in 1992 when a Florida aquarium broke. They rapidly consume small fishes on coral reefs and can produce up to 30,000 eggs every four days. The lionfish’s arrival has sent shock waves of fear among members of the marine community in Barbados. To date, six of the voracious feeders have been killed by divers or caught by fishermen. “As part of our public awareness campaign, we have roped in the divers and the dive association and all the dive shops because, frankly, they are the ones that are out there the most,” said marine biologist Caroline Bissada-Gooding, whose company East Coast Conservation Organization Inc. runs the Lionfish Barbados Hotline. She said the island’s lionfish population is still small and those caught are being collected by members of the Lionfish hotline and taken to the Fisheries Division to be examined. She too has assured the public that the lionfish are quite tasty, especially when prepared in a fillet. “It’s very nice, like white meat, like a snapper. It’s not raw at all,” she said.